Preserve your precious moments with quality and longevity. DVD Video provides viewers with superior video images that are twice as clear as VHS videotape. DVD Video technology uses up to 500 lines of horizontal resolution, VS 240 lines of resolution for VHS, which results in noticeably sharper pictures. Unlike videotapes, DVD Video discs do NOT deteriorate over time or wear out from excessive use. For families with small children (who watch their favourites over and over again) the durability of DVD video will be a welcome sight. The audio component of DVD discs is optimised for playback on Dolby Digital. This means that it's ideally designed for today's high performance entertainment systems. DVD video offers superior digital sound when compared to VHS on all home entertainment systems, regardless of number of speakers. DVD is the most successful consumer electronics product of all time. In less than 5 years from it's introduction; even faster than the CD-Rom, now you too can afford to enjoy this fabulous technology. Once, only for the deep pocketed corporate moguls, DVD can now be an exciting addition to the average consumer, YOU. DVD: encompasses home entertainment, business and computers. It will eventually replace videotape (VHS), CD, and laser disc; extended support from all major computer hardware companies, major electronics companies, major motion picture and music studios; attributing to DVD's astonishing rise to success. DVD "The Time is Now"
THAN ANY FEATURE FILM DVD? Commercial DVDs for feature films are manufactured from a glass master. Each pressing can run to thousands of copies so they are relatively cheap. Using the same process for a few copies of your wedding video would cost a fortune! So the only practical way to produce your wedding DVD is to "burn" it on a computer drive. SO WHICH ARE THE BEST QUALITY DVDs ? 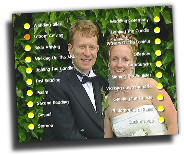 You surely want the very best for your wedding so we offer only disks burnt on computers using the very latest software to optimise picture and sound quality. WHY CAN'T WE HAVE MORE THAN 95 MINS PER DISK? To date DVD-R disks are available to a maximum of 4.7gb storage. The duration of video that can be stored depends on how much it is compressed. For very best quality 95 minutes is the maximum per disk. To squeeze in any more would mean having to compromise quality and may result in fuzzy images and pixelation. - so keep those speeches short chaps! from the video. For a little less you can have no menu.